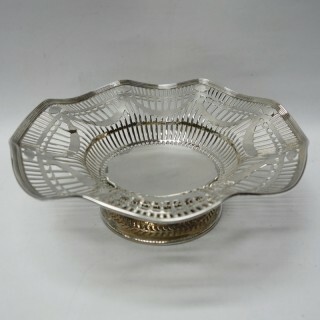 An antique sterling silver dish of circular form with shaped borders and raised on a pedestal foot. All with attractive pierced decoration. Weight 499 grams, 16 troy ounces. Height 9 cm. 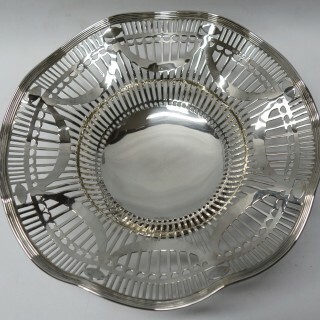 Diameter 26 cm. Birmingham 1924. 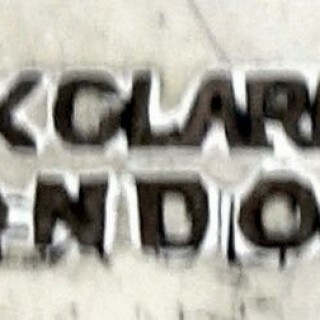 Maker Alexander Clark & Co. Biography – Alexander Clark & Co was founded by Clift Alexander Mawer Clark at Fenchurch St, London in 1891 with manufacturing premises opening in 1894. In 1900 the firm also had manufacturing works in Sheffield, transferring to Birmingham in 1918. It became a limited company in 1912 trading as Alexander Clark Co Ltd. 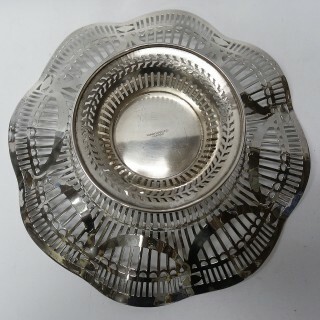 The company had 620 employees and was a specialist maker in the manufacture of sterling silver and electroplated (Welbeck Plate) goods. 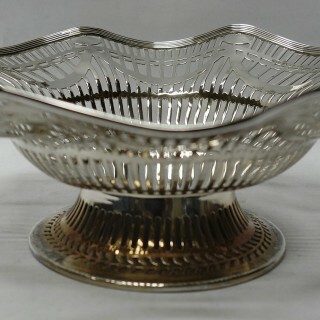 This attractive silver dish is in very good condition with no damage or restoration. 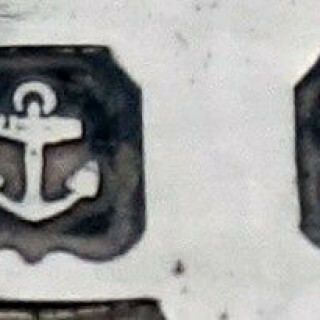 Stamped with a full set of clear English silver hallmarks. Please note that this item is not new and will show moderate signs of wear commensurate with age. Reflections in the photograph may detract from the true representation of this item.